Founded on the banks of Nansemond River in 1742, Suffolk, Virginia, was named after the English hometown of the royal governor. The town was slow to develop, becoming incorporated in 1808, and did not reach independent city status until 1910. Located 20 miles southwest of the much larger city of Norfolk, Suffolk became a regional center for rail transportation and the processing of peanuts. Suffolk’s position as a peanut capital was firmly established when Italian immigrant Amedeo Obici opened the Planters Nut and Chocolate Company in 1912, which eventually grew into a national brand. Suffolk was home to a Jewish community in the 20th century. The first Jews settled in Suffolk in the late 19th century, as the town became a regional railroad hub. Perhaps the first was Harry January, a Russian immigrant who came to America in 1884. His brother Ike came over a year later, and in 1886 the two opened a men’s clothing store in Suffolk. In 1890, the brothers moved January’s to a large building on West Washington Street. Other early Jewish residents included Nathan and Henrietta Lehman, who moved to Suffolk by 1892. Natives of Germany, the Lehmans opened a dry goods store that remained in operation for several decades. Other early settlers included Ben Herman, who came soon after the turn of the century from Baltimore and opened a dry goods store. Arriving in 1904, Solomon Levy had a men’s clothing and haberdashery store on North Main Street. By the early years of the 20th century, there were enough Jews in Suffolk to form a minyan, and they would gather regularly for prayers in the back of stores. Later, they would meet in a room above Morris Werble’s clothing store. In 1914, Russian immigrant Israel Yoffe opened a general merchandise store in Suffolk and began to lead services for the group. In 1916, the growing Suffolk Jewish community established Congregation Agudath Achim with Harry January as its first president. Of the ten founders of the congregation, all but one were immigrants from the Russian empire. Only one founding member was native-born. Although 90% of the founders were foreign-born, most had been in the United States for many years; two-thirds of those who were born in Russia had lived in America for over 25 years. All but two of the ten founders owned retail stores. While 40% owned clothing stores, members also owned dry goods, shoes, and furniture stores. Generally, the founders were middle-aged – their average age was 38 and the oldest was 50. Most of them were recent arrivals in Suffolk – at least six lived elsewhere in 1910. While the members of Agudath Achim wanted to build a synagogue, their numbers were too small to afford it initially. Ike January, who was an active Mason, helped to negotiate an arrangement whereby the fledgling congregation would meet for services as the Masonic Hall. During these early years, the congregation relied on lay leaders for services. In 1922, Agudath Achim established a religious school, which Helen Kozak ran for many years. Around the same time, they hired S. Frankel as their first spiritual leader. Solomon Jaffe, who owned a meat market in Suffolk, served as the congregation’s shochet (kosher butcher), reflecting the traditional nature of the congregation. Since the congregation was small and needed ten men for a minyan, in 1922 the members unanimously approved a motion that “any member who misses 4 Friday night services without sufficient reason will be automatically suspended from membership.” Since most members owned stores that were open on Saturdays, they held their weekly Shabbat services on Friday nights. While Agudath Achim was meeting at the Masonic Hall, its members were busy raising money for a permanent synagogue, even receiving donations from non-Jews in Suffolk. Finally, in 1923, the congregation bought an old Presbyterian Church on Bank Street. They renovated the building into a synagogue, using Gomley Chesed’s synagogue in Portsmouth as their model. They also bought a house next door to the building in 1923. Later, they renovated and connected it to the synagogue, adding a social hall, classrooms, and a kitchen. This synagogue would serve as a home for Agudath Achim throughout the remainder of its lifespan. Since Suffolk was so close to Norfolk and Portsmouth, the congregation never acquired a cemetery of its own. By 1927, 114 Jews lived in Suffolk. Most were involved in retail trade. Old stores like January’s remained in business as Ike’s son Hilary January joined and later ran the operation. Charles and F. Jack Levy took over S. Levy & Sons when their father died in 1934. Newly arriving Jews opened their own stores. B.D. and Dora Laderberg opened a department store in 1916. The B.D. Laderberg Department Store remained in business for many years through two subsequent generations. Their son Frank later ran the store, while his son Gary eventually took over the business. 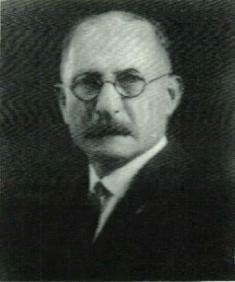 Nathan Weinberg owned Weinberg’s Department Store by 1920, which stayed in business for almost six decades. Arthur Rose opened Rose’s Bargain Center, a five and dime store, in 1929, which remained in business for over 40 years. Several of Suffolk’s Jewish-owned stores were operated by women. Anna Ruden opened the Little Shoppe, a children’s clothing store, in 1932. Her husband Al, who was a traveling salesman at the time, later joined her in the store. Stella Davis owned the women’s clothing store the Fashion Shop by 1940. Lillian Staub owned another clothing store, the College Shop. After Hilary January died in 1965, his wife Mary ran the family store for several years. During the 1930s and 1940s, Jewish-owned stores dominated downtown Suffolk. In 1940, there were at least 21 Jewish-owned stores in town, primarily clothing and department stores. Henry Jaffe owned a large furniture store while Julius Kurtzwile had a hardware store. In addition, Leon Familant ran a scrap metal business, while Meyer Goldberg owned a mattress manufacturing company for several decades. In the early 1940s, Solomon Jaffe opened a meat processing plant called the Suffolk Packing Company. After he died in a tragic car accident, his son Gerald took over the business, running it for 40 years. By 1948, Suffolk’s Jewish population had reached a peak of 172 people. Agudath Achim thrived during this period of growth in the Suffolk Jewish community. They were able to employ several spiritual leaders in the 1920s and 1930s, though none stayed for very long. Their first ordained rabbi was A. Goodkowitz. Rabbi Murray Kantor came to Agudath Achim in 1936. He started a chapter of Young Judea, which had 29 members by the end of the 1930s. Although Rabbi Kantor left in 1940, he returned in 1947, and led Agudath Achim for the next 17 years. The congregation also enjoyed stability in its lay leadership. Al Ruden served as congregation president for 27 years before being named honorary lifetime president in 1964. Jules Kurtz served as secretary for 25 years while Hilary January was the longtime treasurer. By mid-century, Agudath Achim was a Conservative congregation. In 1931, the women of Agudath Achim established a Sisterhood, with Getta Levy serving as its first president. The group held various fundraising events, including card parties, to help support the synagogue. They also organized the annual community Passover seder as well as celebrations for Purim and Simchat Torah. In 1963, after the congregation had officially joined the Conservative movement and the Sisterhood affiliated with the National Women’s League of the United Synagogue of America and helped raise money for the Jewish Theological Seminary. In 1942, women in Suffolk established a local chapter of Hadassah. Over the years, various Suffolk women played leading roles in the Zionist women’s organization. Mary January served on the national board of Hadassah from 1950 to 1953 as president of the Seaboard Region. The purpose of the Suffolk Hadassah chapter, which had 32 members in 1964, was to raise money for Israel and serve as advocates for the Jewish state in the larger community. From its peak in the late 1940s, the Suffolk Jewish community soon began to decline. By 1960, the number of Jewish-owned stores had dropped by a third, to only 14. Henry Jaffe sold his furniture store in the 1950s and moved to Virginia Beach. A few Jewish professionals moved to Suffolk; Martin Goldner was an optometrist, while Herbert Weinberg was a physician in 1960. There were not enough professionals to replace the shrinking number of Jewish merchants, however, as most of the children raised in Suffolk moved away. By the 1980s, few Jewish-owned businesses remained. Julius Kurtzwile retired and sold his hardware store by 1980. Weinberg’s Department Store closed after Nathan Weinberg died in 1978. January’s, which had been in business since 1886, closed in the early 1980s. When Gerald Jaffe closed his meat packing business in the late 1980s, few Jewish-owned businesses remained in Suffolk. The last Jewish-owned store, the Economy Shop, owned by Paul and Naomi Laderberg, finally closed in 2001. Along with Jewish commerce, the congregation shrunk as well. In the 1940s, Agudath Achim had as many as 50 families with 40 children in its religious school. In the mid-1960s, the congregation remodeled their synagogue, adding stained glass windows and air conditioning. After Rabbi Kantor left in 1964, the congregation brought in student rabbis from the Jewish Theological Seminary to lead High Holiday services. Rabbi Lawrence Forman, of Norfolk’s Reform congregation Ohev Sholom, would travel to Suffolk to perform bar mitzvah ceremonies at Agudath Achim in the early 1970s. Larry Ruden, Al and Anna’s son, worked to keep Agudath Achim active, but by the early 1990s they could no longer get a minyan and stopped holding regular services. On December 3, 1995, Agudath Achim held its final service and formally disbanded. 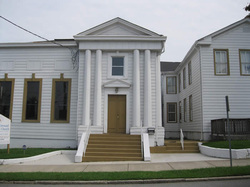 The remaining members donated their synagogue and its contents to Congregation Beth El in Norfolk, while its stained glass windows went to a new synagogue in North Carolina.Today, the only remaining vestige of Suffolk’s once vibrant Jewish community is the former home of Agudath Achim, which is now a church.